The kilted duo pose for the cameras. Lovers of the music of the legendary Scottish folk band, The Corries, will not be disappointed by this tribute act. 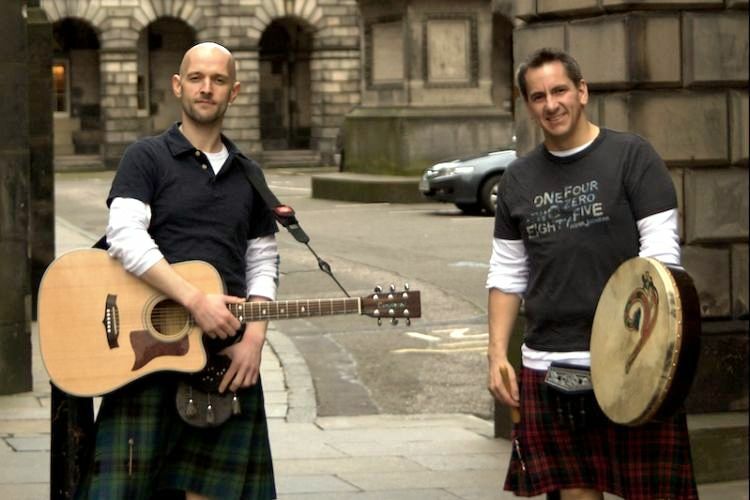 This well-matched duo, Martin Philip and Douglas Kay, run through a programme of Corries cover songs, traditional folk songs, original material, topical observations and witty banter. At one part they even attempt to outdo one-another with virtuoso guitar riffs – duelling acoustic guitars. Throw in an electric mandolin and a pair of bodhrans and these lads will demonstrate their crowd-pleasing talents. It’s impossible to just sit still and listen to The Sorries. It will be all you can do to stop yourself taking to the floor and dancing a jig around the hall. Don’t do it; just clap along, join the lads and the rest of the audience in belting out the odd chorus and have a real good time just like everyone else in the hall.